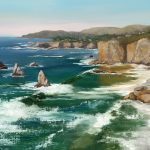 Historic Coastline, oil painting by Sheryl Knight Fine Art, of the cliffs and coastline just north of Pismo Beach, CA, looking towards Shell Beach, Dinosaur Caves, and Avila Beach. Beautiful waves under a clear blue sky. 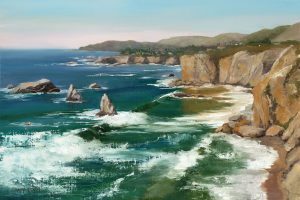 Beautiful day to paint.